There’s a great deal of discussion in scientific circles about sleep, but generally, the experts agree that most adults need between 7 and 9 hours of sleep. They also tell us that we should make sleeping a priority. Sticking to a specific sleep schedule, practicing relaxing bedtime rituals, and exercising daily are all recommended steps to helping you sleep better. But other factors should also be considered, with a comfortable mattress and pillow at the top of the list. Many consumers choose a mattress based on its firmness level and don’t consider other factors, and may end up with a bed that is not quite as comfortable to sleep on as it seemed to be on the sales floor. A mattress topper is a removable piece of bedding that rests on top of a mattress and can remedy an array of issues, from making a too-firm mattress more comfortable, to adding warmth on chillier nights. Choosing the right mattress topper can be as important as choosing the right mattress. 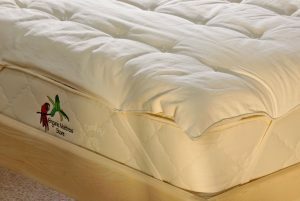 For those with medical conditions such as fibromyalgia or arthritis, a mattress topper can help relieve pressure and sore joints. Additionally, mattress toppers offer a layer of protection for your mattress and are available in a variety of thicknesses. Wool keeps you warm in the winter, but cool in the summer, and a wool topper is great choice for year-round comfort. Wool also pulls moisture away from your body, and studies show this adds an additional level of comfort for the body, which promotes a more restful sleep. Wool toppers are also hypoallergenic, provide natural antibacterial qualities, and are mold and dust mite resistant. Choose a topper with padding that offers a blend of organic wool and cotton, and check for flame retardant factors. Some wool toppers have removable covers while others do not, so, depending on your preference, choose which type will work better for you. Natural latex mattresses , and innerspring mattresses, match up with an organic wool topper and offer ultimate comfort levels for your sleeping hours. They are perfect for chillier temperatures on winter nights, and help your body adjust to an optimum temperature for a restful night’s sleep. Add an organic mattress pad to further protect your mattress and topper. To see additional organic sleeping products, visit our website and check out our line of mattresses and bedding products, from natural organic cotton pillows to a latex organic king mattress, organic cotton blankets, towels, and robes.